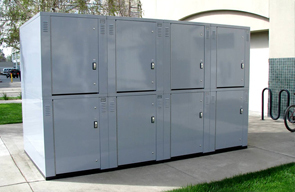 Top of the line bike storage security, Steel Bike Locker's are capable of resisting over 300 lbs of force. 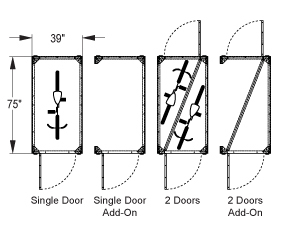 Three-point locking bar mechanism with a 1" wide by 1/4" inch thick zinc plated steel flat bar runs the full length of the door frame to foil any pry entry attempt ensuring maximum security. 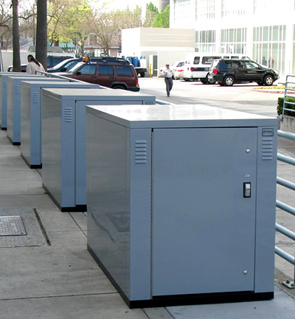 Modular design allows for maximum use of space to securely store one or two bikes in each Bike Locker unit. Solid steel construction using electro-galvanized steel and no weld steel tube framing to resulting a completely enclosed bike storage system. Exterior walls, tops and doors are constructed from 16 gauge steel, while the corners and flooring use heavier 14 gauge steel.The 2 bike storage lockers have an 18 gauge steel interior diagonal divider panel with separate access doors on either end. Weather proof punched-in louvered vents on all four outward facing corners allowing for natural ventilation. Selections of hardware are stainless steel, select from padlock style handle (padlock not included) or heavy-duty pop-out 'T' style handle to suit needs. Fully utilize the footprint with a stacking unit; available in single bike and 2 bike units in both standard and add-on units. All compartments are keyed differently for maximum security. The Steel Bike Locker ships unassembled, is very easy to assemble, using only hand tools. Tier 2 Stacker Units are specifically designed to be stacked on top of a Standard Unit. The interior walls are galvanized steel.